Broccoli Salad nourishes the soul as well as the stomach. When you think of church potlucks, what food comes to mind? Pies, cobblers, cheesy potatoes . . . “Our church has the best cooks.” I’ve heard that said at almost every congregation I’ve been a part of. Oh yeah! JoAnne’s lemon pie. Inie’s Texas sheet cake. Vanita’s punch bowl cake. Rosie’s chicken and noodles. Mary Lou’s cinnamon rolls. Oh I could go on and on. Yet as my husband has struggled with diabetes and I’ve become aware of the food related health needs of friends, I’ve become more sensitive to the fact that church potlucks are a huge temptation for someone who has to watch what they eat. Church people don’t help much because there is the subtle and sometimes not so subtle pressure to attend. Yes, people can make their own choices but it is not an easy thing to do, especially when the pot luck dinner has an unbalanced amount of carbohydrate laden dishes. We need to be a lot more compassionate and merciful at church potlucks. We need to make it possible for people to attend, not prohibitive. The over-arching principle of Paul’s instructions about eating food offered to idols applies here. What I choose to eat or serve does have an impact on other people. If my eating causes someone to sin or pressures them to succumb to something that is harmful to them, it’s my responsibility to lay aside my own eating preferences so I can help my brother or sister overcome the temptation. Let’s make pot luck dinners easier with more healthy and nutritious choices. Yes, there’s still the yummy desert table but at least we can show God’s grace by providing options. Besides, low carb, low fat dishes can be yummy too! That’s why I love this recipe for broccoli salad. It does have sugar in it but I either scant the sugar or use Splenda. (Be careful on using artificial sugars at church pot lucks. Some people are allergic to artificial sweeteners and you can’t always tell that a dish contains them. Also, sugar is not always the issue for the diabetic; it’s the overall calories and carbohydrates that impact their blood glucose. They need protein rich dishes and nutrient rich fruits and veggies.) You can also cut more calories by scanting the amount of bacon or cheese. Some of my other favorite health conscious dishes are deviled eggs, BBQ chicken, 7-layer salad, or cut up cantaloupe. Another day, I’ll share with you my recipe for Italian Pasta salad. 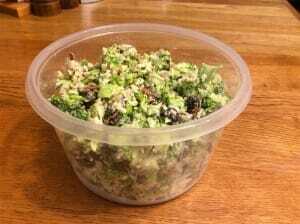 I made broccoli salad for our church’s wiener roast last night. By the end of the meal, it was gone! No leftovers. Too bad. I’ll just have to make more for Jack and me. 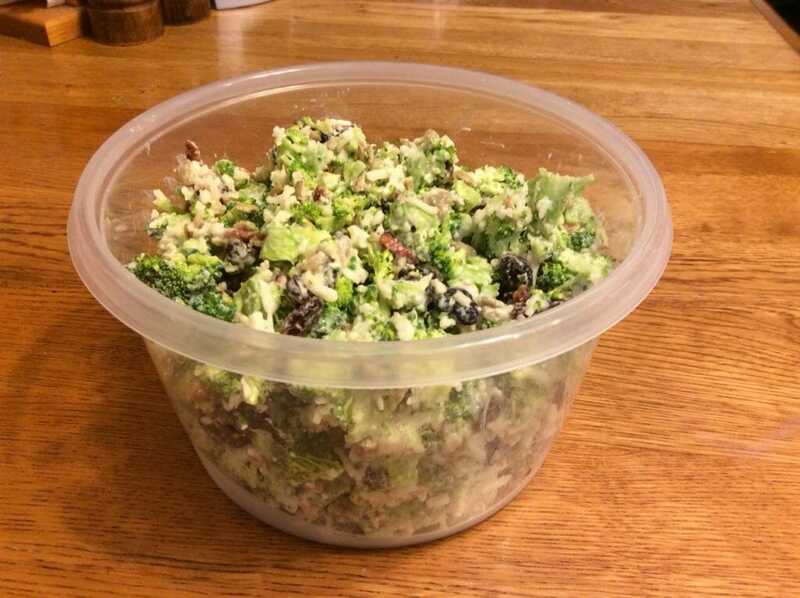 In a large bowl, mix broccoli, bacon, sunflower seeds, raisins & Cheddar cheese. In a small bowl, combine salad dressing, sour cream or yogurt, sugar, and Parmesan cheese. Drizzle dressing over top; toss lightly. You may need to adjust the amount of dressing according to how much broccoli you have. What’s your favorite healthy option pot luck dish? This looks like a good salad. Broccoli is a forbidden food for those on blood thinners. It is a blood thinner. Ulcerative colitis and IBD, Crohns area health issue that avoid broccoli cruciferous ceggies to avoid. When it comes to pot lucks I believe those with digestive problems or other health issues know what happens if they eat certain foods. They can bring a couple of dishes they CAN eat and be satisfied.